The Department of Chemistry congratulates Associate Professor Xiaosong Li on his promotion to Professor, effective September 16, 2015. Research in the Li group focuses on the development of low-scaling methods to resolve excited state properties of many-electron systems, both in the time and frequency domains. This work is complimented by, and finds uses in, the development of efficient methods for studying non-adiabatic dynamics in large-scale systems. 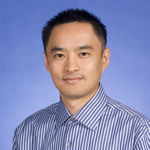 To learn more about Professor Li’s research, please visit his faculty page and research group website.